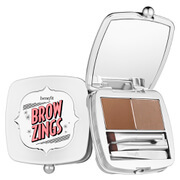 Browwow from DuWop lets you Shape, groom, and highlight your brows with , a three-part compact that allows you to create perfect arches every time. Browwow includes a lightly colored brow powder, tinted pomade, and champagne shimmer highlighter, all fitted into a copper bronze palette with a large mirror and professional double-ended brush. 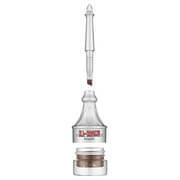 Use the powder over the brows, filling in any areas where more hair/color is needed. This will subtly add definition and volume. The non-greasy pomade, used after the powder, tames the brows, holds them in place, and adds a soft tinted shine that enriches their color and shape. Finish with the champagne highlighter, by applying it on the brow bone, to highlight the brows and eyes. You no longer have to use many different products to achieve perfectly polished brows - Browwow has all three brow essentials in one convenient compact.